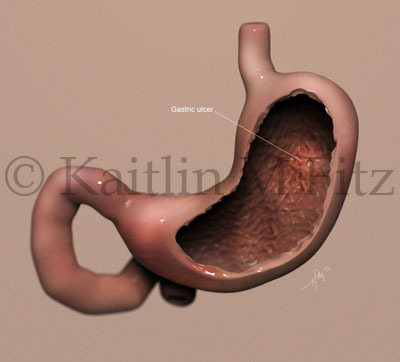 I'm Kaitlin Fitz: medical illustrator, graduate student, design enthusiast, temporary Chicago resident, aspiring traveler, artist, and future master of science. This is my blog dedicated (mostly) to graduate school, earning my MS in Biomedical Visualization at the University of Illinois at Chicago, and medical illustration. Short and sweet. A simple 3D model of stomach with gastric ulcer sculpted and painted in Zbrush, which I just used for the first time. Although I was able to get used to the sculpting in ZBrush, it was definitely a struggle to get used to painting with it. And even though I was warned, I learned the hard way how unfriendly the UI for Zbrush is, especially for a first time use and coming directly from Mudbox. Future Plans: find out an effective way to cut a straight edge in Zbrush and fix the whole “someone took a bite out of my stomach” vibe.